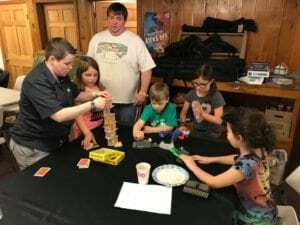 International Tabletop Day: Gaming for BBCH! Have you ever heard of International Tabletop Day? If you’re not a hobby board gamer, then I’m guessing not. 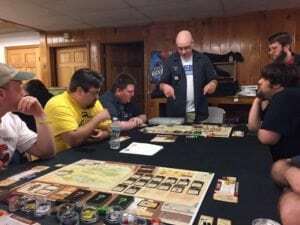 International Tabletop Day (or ITTD for short) began in 2014 to celebrate the love of board games, a rapidly growing industry over the past decade. In 2015, tabletop game sales were a $1.2 billion industry. You also may not be aware of the Extra Life program at the Children’s Miracle Network. Extra Life was created by a gamer, Jeromy Adams, to turn his love of games into a way to help out a family friend, Victoria Enmon, during her struggle with cancer. His effort turned into an avalanche of gamers all wanting to help their local community by playing games for 24 hours. Extra Life has raised more than $30,000,000 for CMN Hospitals since it began in 2008. April 29th was International Tabletop Day and the 4th annual Chits & Bits Game Marathon. 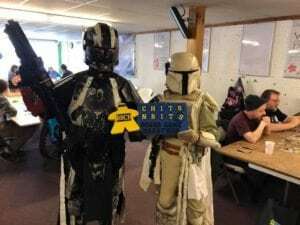 Gamers from across Maine gathered at Crossroad Games in Standish for 24-hours of board games, all to benefit our local CMN Hospital- The Barbara Bush Children’s Hospital (BBCH). We played games, had raffles, ate great food, and celebrated our love of games. With the support of more than a hundred local businesses that provided prizes and catering, we raised more than $22,000 for BBCH, all by doing what we love to do. Since our inception 4 years ago, Chits & Bits has raised more than $50,000 for BBCH. Besides the game marathon, we hold fundraising nights at local restaurants like Five Guys and OTTO Pizza. We’ve manned water stations at local road races, held scavenger hunts, and whatever else we can think of. One of the best things that has come out of our involvement in Extra Life has been the connections that we’ve made across our local community and across the continent. We’ve got a bunch more great events planned for the summer- check out the Event Calendar on our website! We hope to see you there! Previous post: Rite Aid associates adopt cancer program’s Beaded Journey concept to inspire fundraising!